Greetings, dear readers! I don't know about you, but I am really excited about the start of December tomorrow! I love the holiday season, and one of my favorite parts is seeing the nail polish collections that are coming out for winter. 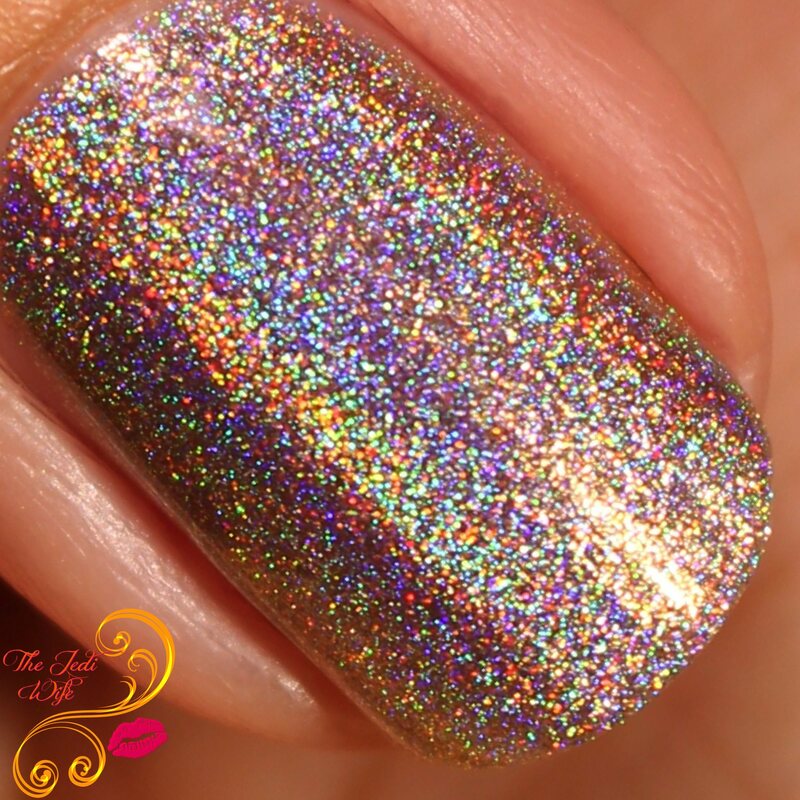 For this evening's blog post, I have KBShimmer's newest collection, The Holo-Day Collection, to share with you. This indie brand really knocks it out of the park when it comes to their creations, and the latest one is filled with eight stunning shades that somehow showcase a beautiful holographic flair. The Holo-Day Collection will ensure that your nails are just as dazzling as the holiday lights! Let's check them out! The smell of pine, crisp air, and crunchy leaves are sure signs the seasons have changed. This green linear holographic polish is reminiscent of hunting down that perfect pine among rows of fir and spruce trees. When you stumble upon that perfectly shaped tree and start envisioning the twinkling lights and hanging ornaments, you will know Fir Sure you picked the right one. For those that lived in snowy areas, the best days as kids were snow days! School cancelled, children bundled up to head out while the flakes were falling to make snow men, throw snowballs, and take sleighs down the big hill. Holographic glow flakes, blue shimmer, and a dash of micro holo glitters shine like untouched snowbanks, accenting the pale gray color of this snow inspired polish. In some lighting this polish looks pale blue, in others, the light gray with blue shimmer. A super fun twist on a silvery winter shade. A beautiful blue holo is life. This mega flame finish is vibrant blue in color, almost a cross between sapphires and lapis lazuli gemstones. No matter what gem you think it resembles, the vibrant jewel toned blue comes alive with amazing sparkle from holo glitters. With coverage in two coats, this blue looks beautiful finished with Clearly On Top, this shade is one you need in your manicure tool box! There are two things that a women needs for a rockin’ holiday party, bold red lips and Christmas red nails. This red polish in our Mega Flame finish is full of sparkle and cheer. 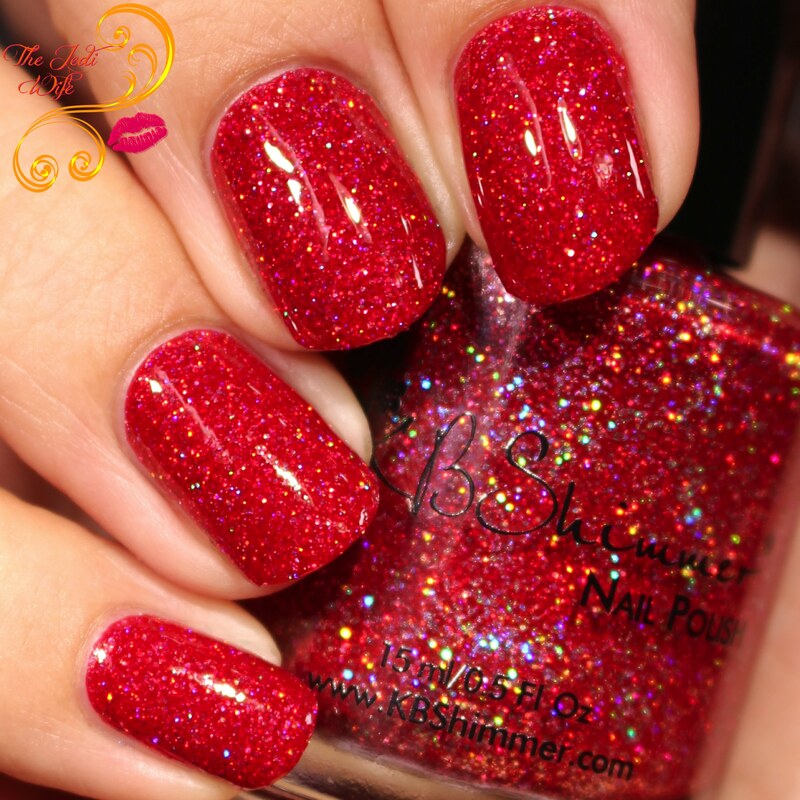 Holographic glitters catch the holiday lights and shine, while accenting this perfectly festive red shade. With coverage in two coats, this red looks beautiful finished with Clearly On Top, for a blingin’ red mani! This polish is thicker due to the glitter load. Today phones are never far from our side, with apps that do everything from entertain with music and games, to balance our budgets, it is no wonder we are app happy. This blue leaning purple has strong linear holo that shines brighter than your phones screen. With two coat coverage this polish won’t interrupt your texting. When the weather gets that chill and sweaters keep you cozy, there is just something special about keeping warm by the fire with a cup of coffee. Reminiscent of a frothy latte, this lightened brown polish is the ideal shade for those that want bling without the bold. Whether you take your coffee with cream or without, this brew-tiful shade is a must have! Like a nebula in the sky, this spacy polish is bursting with a shimmer that shifts from a jewel toned purple to vibrant teal, while holo glow flakes twinkle against the deep navy base. If you have fond memories of star gazing on crisp, cool evenings, you will be over the moon about this sparkling polish. Work, children, entertaining, the thought of in-laws and crazy family members can all stress you right the heck out! But step away from the wine, the only “pour” decision you need in your life is this wine colored lacquer. Pour Decisions is loaded with holo glow flakes for a deep burgundy colored polish. Shifting sparks shine red and copper, showing off the chocolate undertones. Perfect in two coats, putting this on your nails is easiest decision you will make all week. The Holo-Day Collection will be available starting tomorrow at KBShimmer.com, Amazon.com and select salons and retailers. These polishes will feature KBShimmer's new 5 free polish base. The polishes in this collection will retail for $9.25 each. Do you have a favorite shade from this collection? I'd love to hear which polishes are catching your eye! Until next time, dear readers, have a great night! No question about it - I need them all. I mean check out that sparkle! 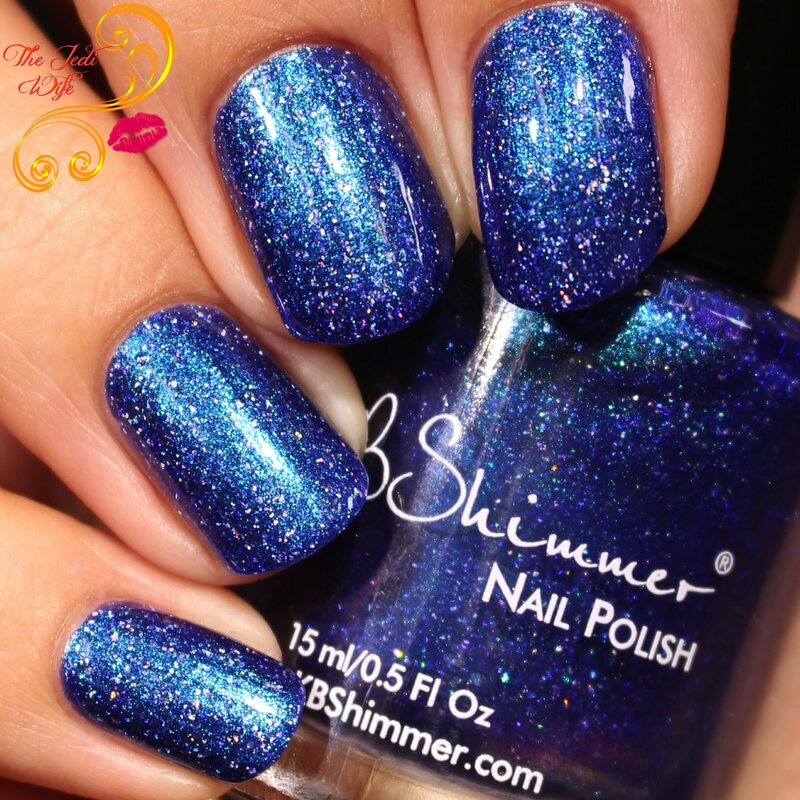 KB Shimmer hits it out the park every time! So lovely! I think my favorite is fir sure. It would be perfect to wear with Christmas outfits. Jewels of the trade is just so pretty!! It always amazes me how KBShimmer comes up with such beautiful polishes all the time. She's done a magnificent job with this collection. Pour Decisions is so so amazing! I'm in love! These are all so cute, just perfect for party season. I think that Jewels of the trade is my fave. These colors are perfect for the holidays! Love the extra sparkle! I love up to snow good! All of these are perfect for this time of the year, since they all are so festive. These polishes are so much fun and perfect for the holiday season. I love the red, white, and silver shades the most! I can totally get behind a Holo-Day collection! Great swatches! god, I love a good clean holo. Wow! Such a pretty collection! I'll take one of each! I think my favorite is Jewels of the Trade though. Must snag that NOW....or maybe Pour Decisions...no just got to get them all! Such fun colors for the holidays! I really like the You're Brew-tiful ones! This whole collection is amazing! I especially like the white one on you! Her holos are some of my favorites. So good! That purple will most definitely be mine. These colors are so amazing. You are really good at painting nails too. Love the all of the shimmer and sparkle and the colors are so much fun. Would love to try some of these. Love the colors you chose, they add a little more touch for the holidays which is fun! I love the "You're Brew-tiful, Fir Sure, and Up to Snow Good." Need to get my hands on these. I like the blue. It's absolutely beautiful. The shimmer is delightful. So many beautiful color choices! I am not really fond of sparkly and bright color but hey, I want to try any from this! I love the "Up To Snow Good" polish. My gf would really love this shade. These colours are fantastic. I think that my wife will love the nebula blue. It's perfect for the holiday parties. Such a fun, festive collection!